The last two weeks we have looked at how to set up healthy habits. This week we continue along those lines by planning what we eat by using a meal planner. Save brainspace at the end of a long day by knowing what’s for dinner (rather than standing in front of the fridge wondering what to cook!). My family are fairly plain eaters so rather than choose from suggested recipes online, I use my own meal planner to write down the meat, vegetables and accompaniments required for each meal and school snacks. I then transfer the ingredients to a shopping list I have created that is sorted by aisle at our local Woolworths store (email me at info@spaceandtime.com.au if you would like a copy of this list). 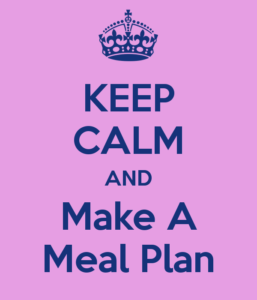 Do you have a similar meal planner you would like to share with us, or if you need a hand sorting out meal preparation check out my Time Management Services or Contact me today for a chat about how small changes to your planning can make a big difference to you evening routine.